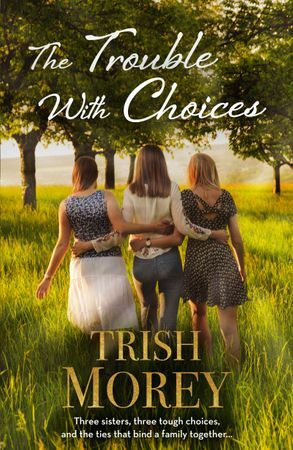 A warm, witty and wise exploration of family and contemporary romance from international bestselling author Trish Morey. The trouble with choices… is they come with consequences. Older sister Beth finds life is tough enough juggling a mortgage, shift work and raising her ten–year–old daughter alone. When she meets Harry, the quiet gardener with a heart of gold, she's determined to place him firmly in the friend zone. How can she let herself love again, when the guilt she carries every day reminds her what love can cost? Will the Faraday girls learn that, with your sisters by your side, the wrong choices can still lead to the right places? Based in Adelaide, SA, Trish always fancied herself a writer. But she dutifully picked gherkins and washed dishes in a Chinese restaurant on her way to earning herself an economics degree and a qualification as a chartered accountant instead. Work took her to Canberra where she promptly fell in love with a tall, dark and handsome hero who cut computer code, and marriage and the inevitable children followed, which gave Trish the chance to step back from her career and think about what she'd really like to do. Writing romantic fiction was at the top of the list. Trish made a choice and followed her heart. Since then, she's sold thirty titles to Harlequin with sales in excess of 7 million globally, with her books printed in more than thirty languages in forty countries worldwide. The Soldier's Untamed Heart/For Revenge...Or Pleasure?